Just been playing mushrooms. First few games were ok, then whatever I won took on the image of a gold coin?! No emmi, I can't say I have come across that before. Looks like one of those occasional 'bug' things you read about. No I haven't seen it. I agree, it looks like a little bug but I wouldn't be too concerned. I'm actually surprised we don't get more in such a high functionality game. Kudos to Mike that so much of it works so well. I haven't checked to see if this bug is there - might be worth checking to see if it's been reported first before posting. 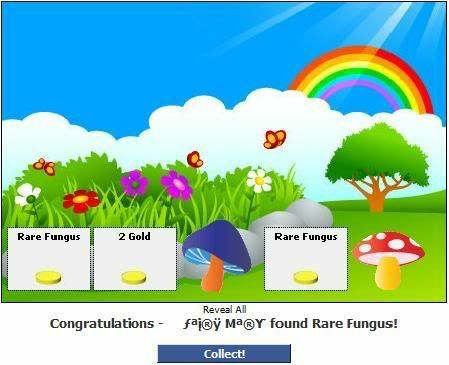 "The Love dust is showing as 1 gold coin in the magical mushroom game at the moment instead of the pink square." "The love dust is showing as normal again, but is the 1 gold coin thing is now happening to naughty dust"
So it has been reported. It doesn't look like Mike has replied, but it can't hurt to add your own experiences to that thread. I just tried the mushrooms, looks normal to me... Perhaps the bug only occurs from time to time? I just tried it too. I had to play 5 times before I even saw anything that wasn't gold, but when I did, it was dust, and it appeared as it should have. I have seen this reported in the bug post, so hopefully will have been fixed or will be fixed soon! It did also happen with naughty dust but as it's been reported I'll sit back. Just thought I'd share it!! emmi wrote: Just been playing mushrooms. First few games were ok, then whatever I won took on the image of a gold coin?! I saw someone else post earlier, he picked a 10gold one then the next came up as a 10 gold too and it changed to a lost sock right in front of him, poor chap!! Amanda & Tiger Lily wrote: I saw someone else post earlier, he picked a 10gold one then the next came up as a 10 gold too and it changed to a lost sock right in front of him, poor chap! !